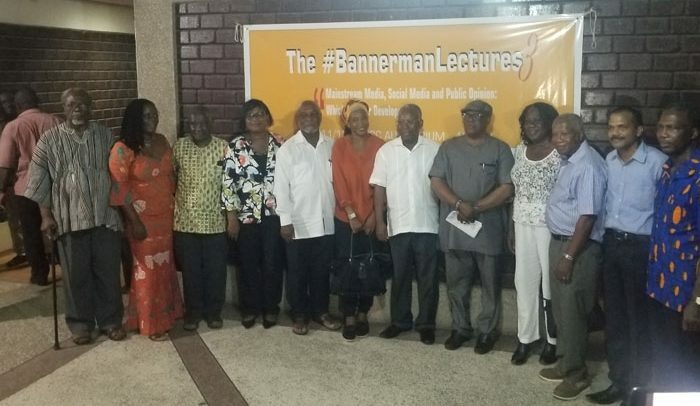 As part of activities honouring Charles and Edmund Bannerman as pioneers of journalism in Ghana, the third edition of the Bannerman lecture was held at the African University College of Communication on November 13, 2018, in the auditorium of the school in Accra. It had in attendance Professor Kwame Karikari of the University of Ghana who chaired the event. Besides, some staff and students of the college, some members of the media, as well as other dignitaries, were present. The lecture was delivered by Nana Kwasi Gyan–Appenteng, the Chairman of the National Media Commission of Ghana. In an opening remark, Professor Karikari highlighted the essence of identifying the motivation of the Bannerman Brothers to start their own newspaper. Professor Karikari stated that the environment of the media and communication technologies had transformed. Thus, measuring public opinion has become more complex. However, there is the need from the beginning to observe what public opinion means, the various channels they are transmitted and the part they play in shaping and influencing public opinions. He concluded by emphasizing the challenges the media encounters and how the ethical standards in the mainstream media are enforced to influence reliable and positive public opinions. In delivering his lecture, Nana Kwasi Gyan-Apenteng appreciated and identified the many efforts of the pioneers of journalism and communication in the likes of Charles and Edmund Bannerman, Sir Charles McCarthy and Mr. Brew, who in diverse ways contributed to the current practice of journalism and communication. He continued by stating that the theme for the lecture touches on the modernity of the profession and its practice. According to Nana Appenteng, the legacy of Charles and Edmund Bannerman set a benchmark for both the motivation and the practice of journalism in the country hence the need for the media to be used as a force for good in the interest of national development. He spoke on the emergence of quite a number of media channels from legacy media to the modern means of disseminating, but the basics of its establishment being lost as most are set up for commercial purposes, leaving the ideology or motivation of it being established to inform, educate and entertain the citizenry. He stated that the emergence of the various interactive platforms like Facebook, Twitter, Instagram and Whatsapp are not only here to stay but would eventually take over the world. He added that social media is now a major factor in shaping public opinion as on a daily basis more people are able to access the Internet and get into the social media fray as a report from “The Digital in 2018” shows that half the world’s population of about 4.021 billion is now online. Nana Appenteng concluded the lecture by saying that in order for the media to be a force for good in the country, the regulatory environment needs to work to strengthen the capacity and ability to enjoy human rights as its absence is threatening the enjoyment of these enshrined rights.